Captain Jason Dyer, who learned to sail as a 7-year-old at the Fort Worth Boat Club on Eagle Mountain Lake, spent more than 30 years at sea as a professional mariner. Now he’s come back to his home waters and opened a new on-water towing and assistance service for recreational boaters. 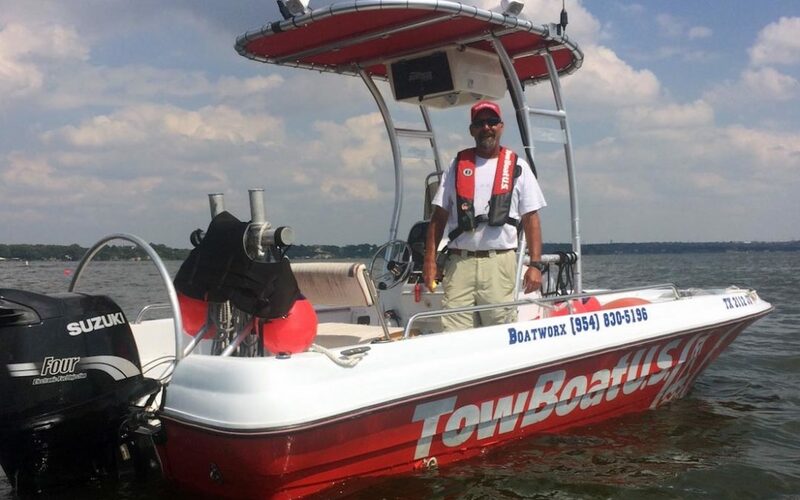 As the owner of TowBoatUS Eagle Mountain Lake, he’s on call 24 hours a day, seven days a week, ready to assist any boater who needs fuel, a battery jump, help off a sandbar or a tow back home after a breakdown. Much like a reliable auto club for boaters, TowBoatUS offers on-water Unlimited Towing Membership Plans for freshwater boaters and anglers for just $72 a year which includes BoatUS membership. There are no deductibles. Boaters face costs that average more than $700 per towing incident – with some paying into the thousands out of pocket – when they don’t have an annual BoatUS towing plan. Dyer’s love of boating led him to a life on the water that has included two years in the US Coast Guard (USCG), six years of commercial fishing in the North Atlantic, eight years as captain of private and charter yachts in the Caribbean, Europe and Atlantic Coast, and 13 years as master of supply vessels in offshore oil fields. He holds a USCG Master License and is an experienced diver. Dyer’s response vessel, which is based at the Fort Worth Boat Club, is a 19.5-foot Triumph 190 with a 140-hp Suzuki four-stroke outboard. It is easy to recognize with its bright-red hull and TowBoatUS name in big white letters on both sides. Fully rigged for towing and salvage, on board are powerful pumps, battery jump packs, dive gear and extra fuel. TowBoatUS Eagle Mountain Lake can reached by calling the local office directly at 954-830-5196 or by calling the BoatUS toll-free 24/7 Dispatch Center at 800-391-4869, and via smartphone with the free BoatUS Towing App. More information can be found at BoatUS.com/towing.